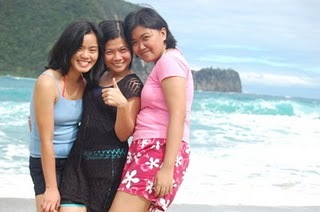 Visiting Baler, Aurora is becoming a kick-off activity for my friends and I. Ever since our first trip last January 2009, we always find ourselves going back to this beautiful surfing spot. Going to Baler usually takes about 8 hours. Aside from the long drive, you have to endure about 2 hours of rough road. And I really mean a rough and bumpy road. It’s better to leave Manila at midnight so you will arrive in Baler at 8 am or earlier. We left Manila last Friday, February 12 around 11 pm. We reached Cabanatuan, Nueva Ecija at around 2:30 am, Saturday, February 13. From there, we travelled the next 4 hours through rough and bumpy road until we arrive in Baler. Believe that you will forget the long drive the moment you see and hear the waves. We ate our breakfast before we start our activities for the day. We ate traditional Filipino breakfasts but it seems like everything tastes so good when you eat by the beachfront. Right after breakfast, we changed and communed with the waves. Then, we watched the first batch of surfers as they get their drills and start their lessons. Zha and I decided to pass surfing for this trip. Jo, on the other hand, decided to take the Sunday morning class. Saturday afternoon went quiet cause Zha and I slept after lunch while Jo stayed up to read and stroll. At 5pm, Jo and I went back to the beach to watch some surfers and play with the waves. After tiring ourselves, Jo and I went back to our room to change and get ready for dinner. There was a beach party at Bay’s Inn. Our trip coincided with the 4th Aurora Cup Championship. Surfers from La Union, Daet, CamSur, Siargao and Zambales were there. By 10pm, we were already tired and sleepy. And so, we called it a night and retreated to our rooms. Come Sunday morning, Jo woke up to watch the sunrise. Zha joined her and I followed them at around 6am. Unfortunately, the sun did not showed itself because there was a thick fog. We had our breakfast and Jo got ready for her surfing lessons. Our new found friends, Grace and Marie joined for the morning lessons. It was another great weekend spent in Baler. As usual, I have compiled some quotable quotes from this trip. My friends and I dream of covering as much of the Philippine Islands as possible. Next in our destination is the famous Boracay Island. I know that WOW Philippines Travel Agency offers great Boracay Packages! . Visit Seair Philippines for more details!